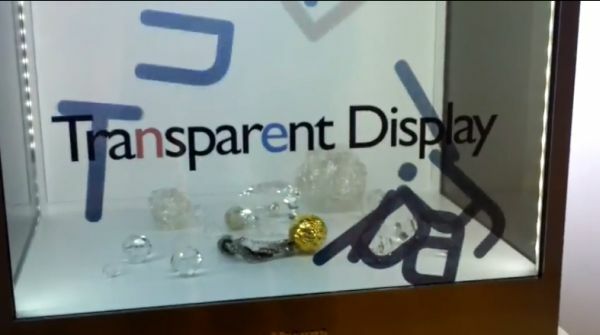 Samsung has long been working on transparent screens. Has finished the first commercial models. This time is not intended for the consumer market, but the business world. It is a very original solution to present products in stores or at various events. The Samsung NL22NB notable for its transparent screen with a diagonal of 22 inches (55.9 centimeters) and a 16:9 aspect. This is a Monitor LCD TFT active matrix, which offers a resolution of 1680 by 1050 pixels (WSXGA +). The thin transparent LCD panel is mounted on the front of a cube-shaped box. Actually, the box hides a PC all in one, which weighs more than twelve kilos, with a size similar to a microwave. The box, which looks like a tank, has a slash resistant glass and LED lighting. That way, you can combine the physical objects that interact exhibitor with digital images, so that anyone who visits the store display immersed in an experience out of the ordinary. This computer all in one with transparent screen processor integrates AMD A4-3310M dual-core processor and 2 GB of RAM, which can be extended twice. Addresses storage solid state drive ( SSD ) 32GB. The graphics card is also AMD, namely a Radeon HD 6620G. The box also incorporates tiny 3W speakers, to showcase it more lively. In addition, they can network and access the Internet, thanks to a port Ethernet . The viewing angle of the transparent screen is 160 degrees horizontally and 140 degrees vertically. Moreover, the contrast is quite high, since it has a ratio of 500:1. The panel response time of only 5 milliseconds. 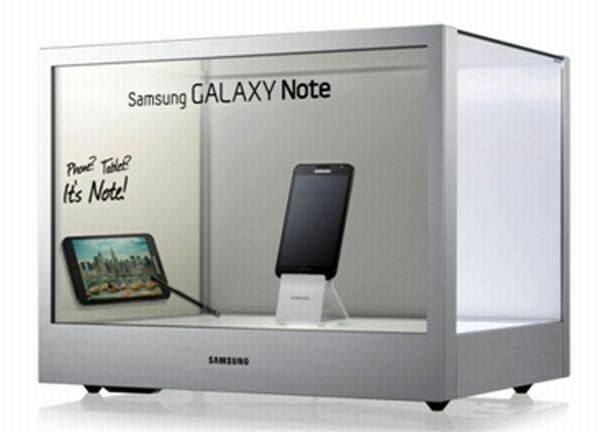 This past June, Samsung took advantage of the celebration of the InfoComm 2012 trade show to display its first units of transparent monitors. There, he showed the possibilities of your product to showcase luxury items such as watches and jewelry Gucci. It is expected that the collaboration between the Korean manufacturer and Gucci repeat at the upcoming IFA 2012 that will soon take place in Berlin, where visitors can admire an example of art showcase for more exclusive outlets. In addition to this version of All-in-one with transparent monitor, the brand also has an optional kit with a diagonal of 22 inches that can be mounted on the wall. This exhibitor has installed digital MagicInfo Premium software, an application developed by Samsung dedicated to presenting multimedia large-format screens. It also includes a version of the Office suite preloaded Microsoft Office 2012, but you have to purchase a separate license to activate the software. The dimensions of this monitor are professional commercial and 51.36 by 37.75 by 39 centimeters. The sale price include indirect taxes for the Samsung SyncMaster NL22NB at 4,200 euros.